Here’s a cute app for under 5s. • Simple, graphical navigation. No reading required! • Gentle animated help allows child to learn the app independently. • Gorgeous, hand-drawn art by award-winning children's book illustrator Steven D'Amico. • User-focused design lets the child set his or her own pace. • Relaxed atmosphere makes Tiny Tiger and Friends perfect for young children. • Designed and tested by parents for parents. • No voice-over instructions—Tiny Tiger and Friends can be enjoyed without audio when necessary. • Perfect for any situation; it can be enjoyed alone, with a parent or with a friend. • Frequent pauses provide convenient stopping points when it's time to turn off the game. 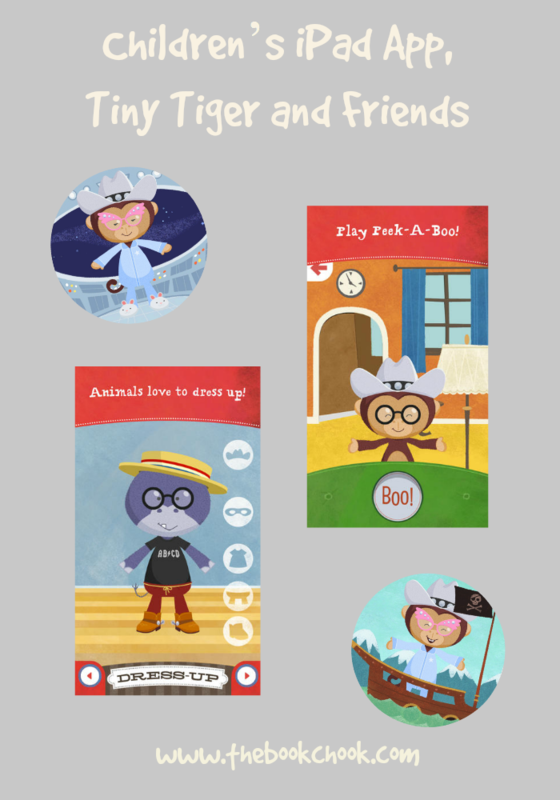 • Friendly animated characters will inspire your child's imagination and creativity even after they’re done playing. • No advertising or in-app purchases. The developers have definitely been successful in creating an app that works easily, is heaps of fun, and is likely to be intuitive for most kids to use. It capitalises on games like Peekaboo that all kids know - in the app, kids touch the BOO sign and a character pops out of a hiding place. Little ones will love dressing one of the three characters they choose: monkey, tiger or hippo. Dressing up is simple, involving making a choice from a range of different headgear, tops, bottoms, shoes etc and "trying them on". Youngsters can then put a dressed character into different scenarios and take his photo. I love the idea of children creating an image in this way. It might prove to be the prompt they needed to make up a remarkable story. Poke-A-Nose is another fun game where kids need to concentrate to tap only the nose of their character amid multiple pop-ups. The games are all playable by kids on their own, but I believe children will benefit most by discussing what they’re doing with a parent. Probably my favourite thing about Tiny Tiger and Friends is the art work. It’s attractive and suits the age group. I abhor the garish, huge-eyed characters I see in lots of children’s apps, so kudos to the developers for going with a talented children’s book illustrator.